Carbon dioxide (CO2) is a commonly used additive in food and beverage industry (e.g. for soft drink, brewery, and champagne carbonation). Its fabrication process can lead to the presence of impurities such as aromatics, BTEX, ammonia, acetaldehyde, Total Hydrocarbons and sulfur compounds (Total Sulfur Content, SO2, COS, mercaptans...). To ensure people’s safety, limit values of these impurities has been set by various health and safety regulations. 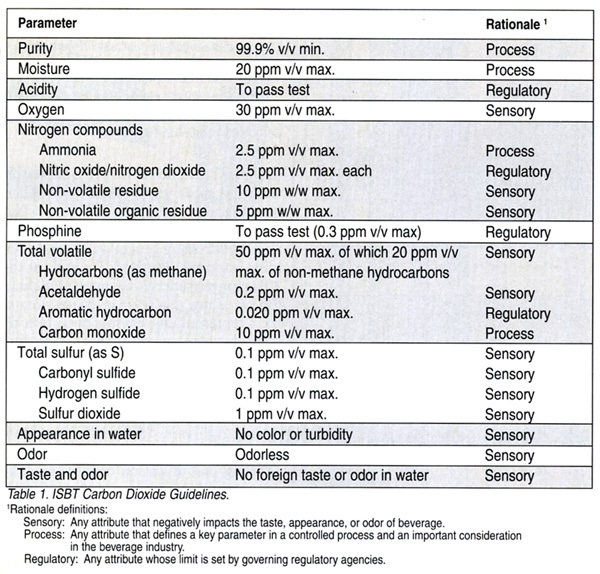 The International Society of Beverage Technologists (ISBT) CO2 Guidelines offers a list of parameters including the molecules listed above and its recommended limit (Table 1). chromaS-COS : 5U module for Total Sulfur analysis. Speciation of H2S, mercaptans, DMS, DMDS, COS, CS2 and SO2 by dual Flame Photometric Detector (FPD) using a filter specific to sulfur compounds. airmoVOC BTEX : 4U module for acetaldehyde and BTEX analysis using a Flame Ionization Detector (FID). MCERTS certified for benzene measurement following EN 14662-3 (2013) and TÜV certified for BTEX analysis (1996). The high stability and the ease of use make Chromatotec’s analyzers perfectly suitable for CO2 quality control. Moreover, results are validated by the internal calibration system.